Editor’s note: This story has been updated to clarify the level of community pushback for this project. 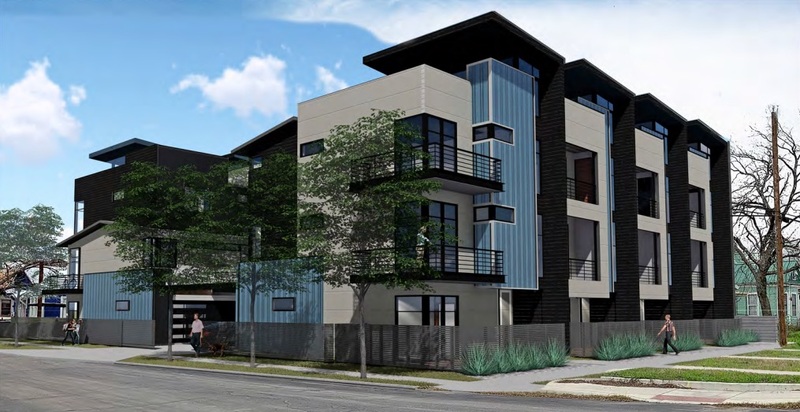 A townhome project proposed for Government Hill has met resistance from some longtime residents who are worried their near East Side community is changing without their input. 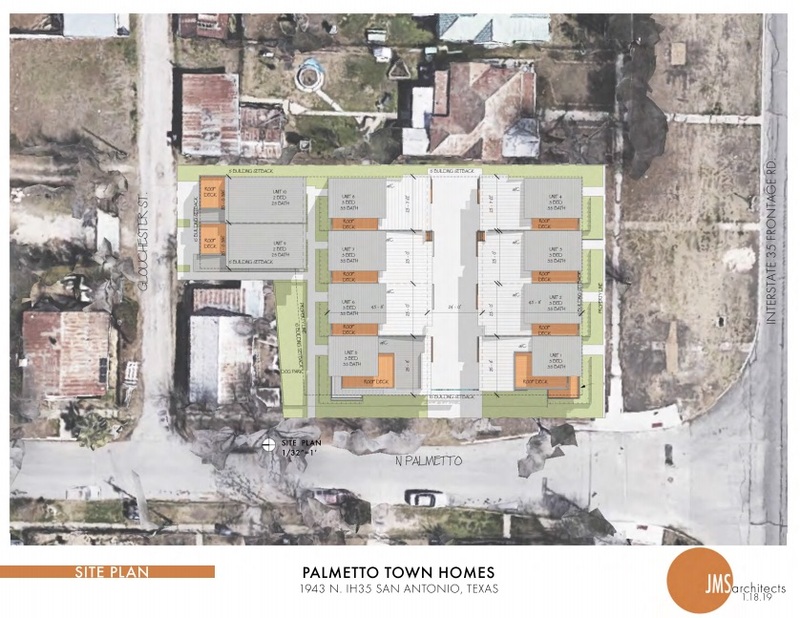 The three-story buildings that comprise the Palmetto Town Homes are proposed for a 0.4-acre lot at 1945 N. Interstate 35. According to county records, the property is owned by Gilley Properties International of San Antonio and Anaxor Investments, a McAllen limited liability company. The project was set for a Historic Design and Review Commission (HDRC) hearing on Wednesday, but it was postponed before the hearing started. Some members of this community say the developers have not met with them. “All we want is transparency,” resident Cindy Tower told the HDRC after learning the project was pulled from the agenda. 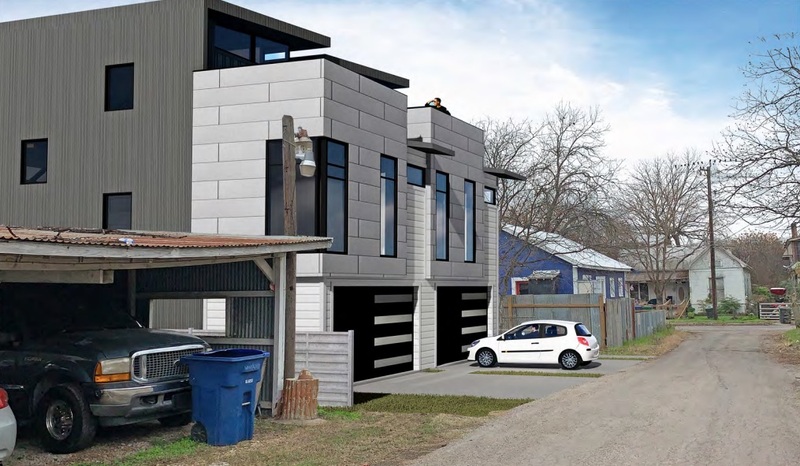 Denise Gutierrez-Homer, who’s running for the District 2 City Council seat, also attended the meeting and said the project’s design, by JMS Architects of San Antonio, does not look like the other homes and structures in the neighborhood. JoAnne Murillo, another resident who attended the meeting, who who lives two houses away from the site, compared the Palmetto homes’ design to boxcars, in comparison to the “folk Victorian” homes in Government Hill. 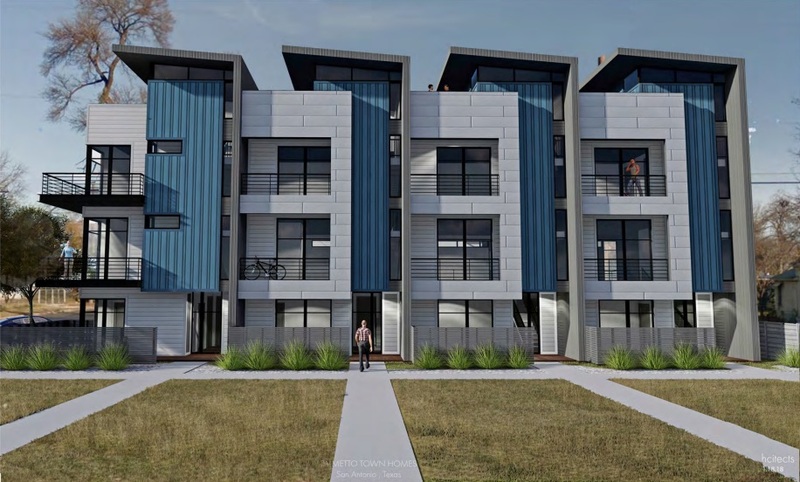 The city’s Office of Historical Preservation (OHP) recommended that the HDRC deny approval of the Palmetto Town Homes, citing several issues with the conceptual design. Mainly, some of the proposed structures in this development are too tall, OHP said. 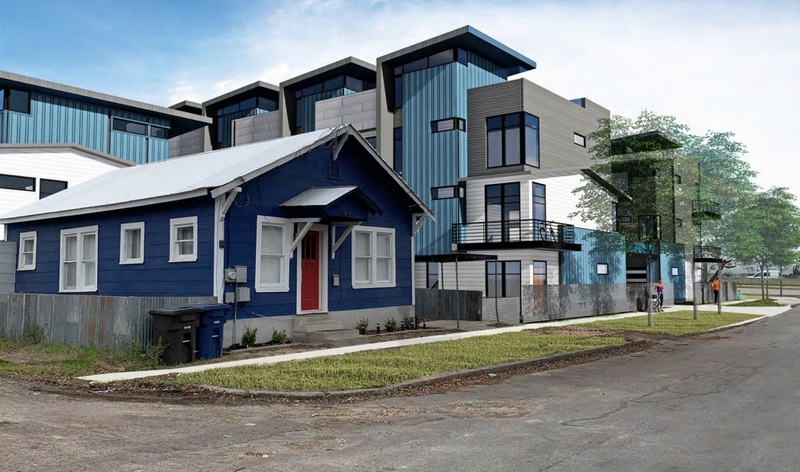 New construction within historic neighborhoods, for example, must be within one story of nearby historic structures, according to the city’s historic design guidelines. Two of the Palmetto buildings are designed at 42 feet 6 inches tall, nearly four stories. Meanwhile, nearby historic structures are 1-2 stories tall, meaning the proposed near-four-story townhomes do not comply with the guidelines. The third building, at three stories, would comply. Among OHP’s other concerns were that proposed construction materials for the project—metal siding and cement plaster, and the flat and shed roofs that would adorn the buildings. According to OHP, the buildings’ height would be significantly reduced if these materials were removed. OHP also recommended additional building entrances at North Palmetto and Gloucester streets, and the addition of porches to coincide with the other homes in the neighborhood. In a phone interview, Carlos Mendonza of Gilley Properties International said the project was likely pulled from the HDRC agenda so that JMS Architects could make adjustments. Mendoza did not give estimates for the cost of the project. 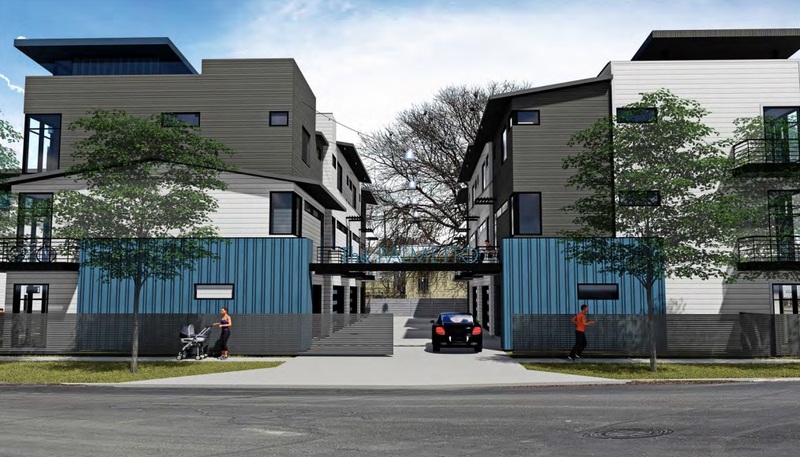 He also said the development team will decide whether to seek incentives from the city after the property goes to a hearing before the Zoning Commission on Feb. 21 to change the site plan from residential single-family to an infill development zone. The Zoning Commission rejected the case on Dec. 4, 2018. During the interview, Mendoza described himself as one of the owners of the project. JMS Architects nor Brown & Ortiz, the firm representing the developers, could not be reached for comment. I don’t get these people. Someone wants to build a nice new building in your neighborhood. Not even IN the neighborhood on the outside next to I35. It’s a little generic but it is new and looks nice. You should welcome them. All the houses in that area are older run down homes (just the truth) why would you want a new building to look like them? Mark M. You are very disrespectful in you description of our neighborhood. Yes, our houses are old. That is what historic is, older structures with certain defining features. Yes, some of our homes need some rehab, but that is a matter of money being available. That does not mean that our neighborhood homes or the people who live there should be disrespected as you did. However you were using your 1st amendment rights. Sad that it was to disparage instead of lift up. I love them, there are some builds behind where the old Victoria Homes were. I don’t tihink that these homes should be available for low income, Section 8 Housing. They are the future housing for upper level middle class. “Members of this community say the developers have not met with them.” I was at a Government Hill neighborhood meeting with dozens of neighbors, where a representative for this project presented it to neighborhood residents, and then neighborhood residents shared their opinions of it with the representative. The neighborhood association keeps minutes i think, so you shouldn’t have to rely on my or anyone else’s memory to correct or improve the article. Thanks for trying to cover the story. When was this meeting and where was it held? Ben, the meeting was held on Jan 28th. There will be a HDRC meeting on Feb. 20th and a zoning meeting the next day relating to this issue. The witness, as she describes herself, was untruthful. The members in attendance were 12, that is one dozen not dozens. The president,,who continually supports the developers, did not allow for full discussion. We had not discussed the 3 to 4 story buildings or any allotment for green space. She quickly called for a vote she said so the development could move forward. The vote was 8 for and 4 against. Then she said that my vote was not counted because I was not a member. I am a member and have the check receipts to prove it. She is not allowed by city policy to choose who can and cannot be a member, but she has done this to a number of people besides me..
My email is mhawkins5840@gmail.com if you or any one else wants to contact me. Did people just not show? It would not be the fault of the developer if members of community did not show up to a public meeting. I also do not know why these are being fought. They are right on the freeway access road. Think of them as a nice looking noise barrier.